We continue to remain invested in high quality small and mid cap companies with strong fundamentals and recently increased allocation in these companies considering significant fall in stock prices since Jan 2018. We believe severe correction in broader markets with significant fall in stock prices of small and mid caps in last 15 months is giving a wonderful opportunity to long term investors to build a diversified portfolio by investing in good companies backed by strong fundamentals at much lower prices. We expect cyclical stocks with strong fundamentals will outperform going forward considering reasonable valuations, stable crude oil prices and higher spending of middle class with rising disposable income. With fall in stock prices in broader market during last 15 months, small and mid caps valuations turned attractive to reasonable. In fact, many good companies are available at valuations which look very attractive considering the earning growth these companies are expected to deliver over next 2 years. This is not the time to sell but to accumulate good companies available at discounted valuations. Moreover, we can see renewed buying interest in small & mid caps in coming months considering strong flows from FIIs during this month. As mentioned earlier, bad sentiments do not last for ever, its time for long term investors (2-3 years) to start accumulating good quality stocks which after a long time are becoming available at attractive valuations. High quality companies reporting 20-30% + annualized growth can deliver exceptional returns for the shareholders in long term. In case you have not yet started building a portfolio of high quality and high growth stocks for long term wealth creation, you can initiate your investments now. 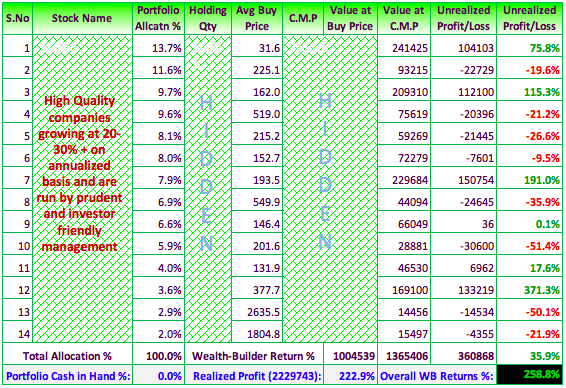 Below is the Wealth-Builder portfolio allocation and performance update for your reference. Since inception, our Wealth-Builder portfolio has outperformed Nifty and Sensex by wide margin delivering CAGR of 22.7% where as Sensex and Nifty have delivered CAGR of 11.5% and 11.3% respectively during the same period. Since 1st Jan 2013, Nifty has given returns of 95.3%, Sensex returns is 97.5% where as our Wealth-Builder portfolio has given returns of 258.8% to our members. We continue to hold high growth companies with robust fundamentals as we believe these companies are available at reasonable valuations, registering good growth every quarter and doing all the right things to continue delivering robust top line and bottom line with strong operating margins. There were few laggards also which have not performed up to our expectations and we exited these stocks and allocated the available funds to other good investment opportunities as a continuous process to ensure that Wealth-Builder portfolio continue to outperforms major indices by wide margin. Note: Wealth-Builder portfolio update - March 2019 will be released on 31st March'19 (before end of the day) and we will share the same with our Wealth-Builder members. Start managing your equity portfolio like a professional, subscribe to Wealth-Builder by paying nominal annual fee of Rs.20,000 18,000 for entire year availing 10% discount under ongoing Holi Dhamaka offer. Click here to subscribe to Wealth-Builder online. Subscribe now and we will ensure that you receive our Wealth-Builder portfolio - March'19 update once it is released on 31st March 2019. We are pleased to inform you that you can subscribe to our services at discounted prices under our ongoing Saral Gyan Holi Dhamaka Offer 2019. We suggest our members to consider current market situation (post severe correction in small & mid caps over last 15 months) as a buying opportunity and invest in high quality small and mid cap stocks. Hurry! Last 2 Days... Offer closes on 31st March'19 at 11.59 PM. Click here for details.